Michael Okoye, sometimes known as Michael Okoyoh, is the playmaker of Warri Wolves FC and a very promising player. Okoye is born 16.08.1991 and is therefore still a teenager. Okoye is very comfortable on the ball, skillful and hard-working. Okoye was a sensation for Warri Wolves FC in 2008-2009, his first season in the Nigeria Premier League. He scored three league goals from his midfield position. During the season, Okoye received praise from the Super Eagles coach, Amodu Shaibu. 2009-2010 was another good season for Okoye and he managed yet another three league goals. Okoye currently forms a brilliant duo together with defensive midfielder Emmanuel Omodiagbe in the engine room of Warri Wolves FC. Okoye has not scored yet during the 2010-2011 Nigeria Premier League. According to the interview, Okoye is a former player of Ebonyi Angels FC. As far as I know, Okoye has never been part of any Nigeria national football team, which is somewhat of a mystery to me. He has been a consistent performer in the Nigeria Premier League for more than two seasons and deserves a chance to play at a higher level of football. The picture is of Okoye, the player in red, and is taken from SportsDay. Chimezie Mba is currently one of the most interesting defenders in the Nigeria Premier League. 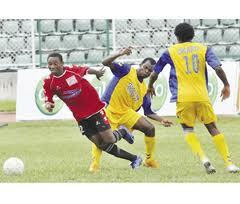 Mba started the season at Ocean Boys FC but joined high-flying Warri Wolves FC in January 2011. Nigeria U-20 squad was born in 1990 or 1991, it seems likely that Mba is 20 or 21 years old. Mba played for Nigeria U-20 against Trinidad & Tobago in a friendly match played in May 2009. Mba joined Ocean Boys FC before the 2009-2010 season and scored at least one league goal. Mba has been a revelation since joining Warri Wolves FC and was named in the Team of the Week after Round 18 of the 2010-2011 Nigeria Premier League. Mbe he was Man of the Match when Warri Wolves FC beat Shooting Stars FC 1-0. Mba was named in the squad of the Nigeria U-23 national football team in February 2011 and some experts also think he should be a contender for a place in Samson Siasia’s Super Eagles, the Nigeria national football team. Samm Audu, a well-respected Nigerian football journalist, has described Mba as “a machine” and a “modern-day warrior”. Mba is apparently “powerfully built and packed with high intensity”. I agree with your comments but the next player to watch is mu brother in law Chinedu Emeka- 6’7” and having experience in England he will bring a valuable experienced head to a team with a lot of inexperience. He is a real leader on the pitch and with the support of the faster boys around him it could be really intereesting.